The $365 No-Limit Hold 'em event is now in the money. The final 72 players are all now guaranteed at least $539. 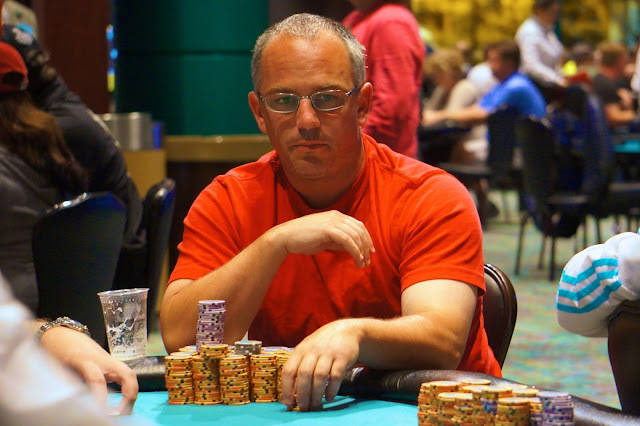 With the chip average at just over 100,000, Foxwoods legend Pete Campo is near the chip lead with 360,000. The players in the first WSOP Foxwoods Circuit event are now on their one-hour dinner break. There are approximately 190 players remaining. The first event at the WSOP Circuit, the $365 No-Limit Hold 'em, drew 641 players. The players in the $365 No-Limit Hold 'em event are currently on break. When play resumes, the blinds will be increased to 100-200 with a 25 ante. There are currently over 600 players in the field with registration open for two more levels. The 2013-2014 WSOP Circuit is officially underway at Foxwooods! Cards are in the air for the first WSOP Circuit Ring event of the 2013-2014 season at the Foxwoods Resort Casino. The $365 No-Limit Hold 'em event with a $75,000 guaranteed prize pool is now underway. Players start with 10,000 in chips and the first 12 levels are 30 minutes in length. There are currently 350 players in the field with a line to register that goes the length of the poker room!